Please note that our Summer Camps are for rising 3rd graders (must be 8 years of age by 9/1/2018) through rising college freshman. Beginner = Camper has little or no coding expreience. Intermediate = Camper has a few months to a year of coding experience. Advance = Camper has used code to solve problems and create projects. Experienced = Camper must have taken/participated in a computer science, robotics, and/or engineering class/camp. Team Work = Campers will work in pairs, sharing a computer and robotics kit with their partner. 1.Drop-off will run from 8:00AM - 9:00AM. Upon drop off, students will be taken to camp rooms for pre-camp activities. If you are dropping off from your vehicle, please do not park, get out of your car, or drive around the car in front of you in line. A camp facilitator will be there to assist your student. If you need to park your car, please do so in the area designated on the map below and walk your camper into the building and all the way to the camp rooms located on the third floor. 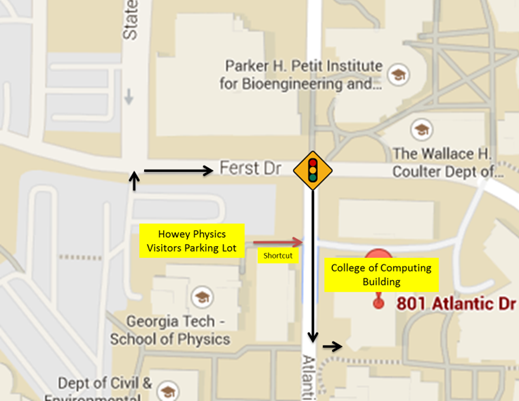 Please keep in mind that GA Tech is an open campus. Please do not drop off your child unattended. Please review the on campus parking section of this document. 2. Car Pool will begin at 3:00PM. Students who are not in After Care will be escorted to car pool by a camp facilitator. 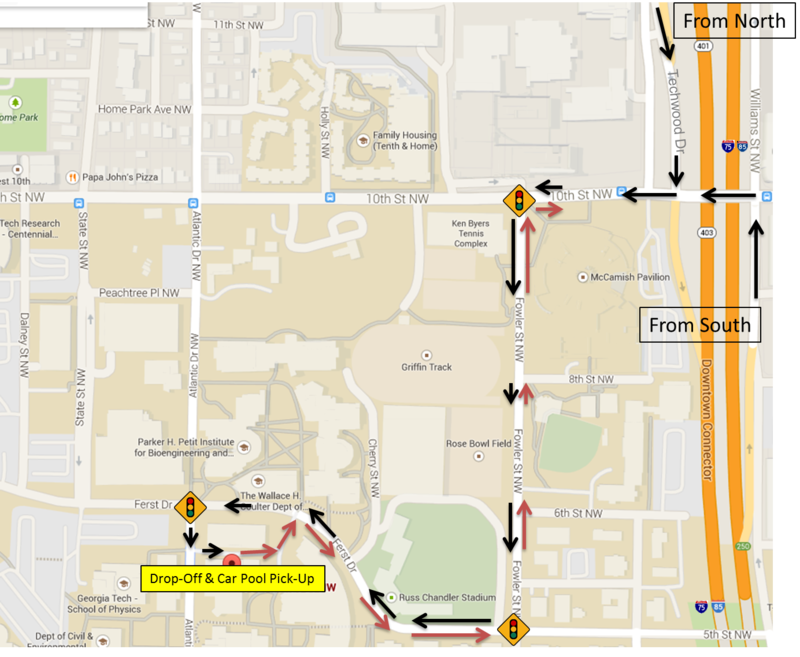 (The Car Pool location is the same as the Drop-off location). NO campers will be released from the car pool line as walkers until car pool is over. 3.Walk-In Pick-Up will occur in Room 345 of the College of Computing Building, (The same building as Drop-off.) Please park in the location indicated in the Map section of this document. Please review the on campus parking section of this document. 5. Fees are due no later than the following morning at Drop-Off. Your camper will not be accepted back into camp until fees are paid. Your payment must be made via the same online payment process used for registration. Camper will be dismissed from the program with no refund of camp fees. Activities such as board games; arts & crafts; puzzles and movies will be coordinated between 8:00AM and 9:00AM to awaken our campers' minds for a day of learning experiences. 1. Lunch will be provided each day as part of the camp experience. Campers who register late (less than a week in advance) will be responsible for paying for their lunch. 2. Camp participants will either eat lunch at the food court in the Student Center or enjoy lunch outdoors in a shady location. 4. Students will receive a $9 lunch card each day of camp, except Friday when we order pizza for everyone. 5. The student will be responsible for paying anything above their daily limit. Unfortunately, balances do not carry over to the next day. 7. If your child misplaces/loses their meal card, we will be unable to pay for lunch for the remaining camp sessions, with the exception of Friday. 8. Unless the camper has indicated dietary restrictions, snacks will be provided during morning and afternoon instruction and activities. Those with dietary restrictions can bring their own snacks to be eaten during these time periods. 1. On Wednesdays, campers will have the opportunity to enjoy the campus indoor leisure pool which is equipped with swim lanes; water play area; lazy river; a water slide and a staff of lifeguards. 2. Campers who will be participating in pool activities will need to bring a bag containing their swim clothes; towel; pool shoes or flip-flops. Campers may also bring wearable floaties and goggles if desired. This bag will hold their regular clothes while they are swimming. Please label the bag and all of its contents with your camper's name. 3. Campers will be carrying their bag and wearing their pool shoes or flip-flops to the pool as we will be leaving their camp shoes and any other valuable belongings locked in the classroom. Campers will change into and out of their swim clothes in the recreational center locker rooms. 4. We will contact you to fill out the necessary swimming permissions form prior to attending camp. 5. Activities such as board games; arts & crafts; puzzles and movies will be coordinated for campers who do not wish to swim. 2. After Care payments need to be made via the same online payment process used for registration, no less than one week before the beginning of camp. An additional $10 per week will be charged for After Care fees paid after Monday, before the week of your child’s camp. 3. Cancellations a month in advance will be refunded. Less than one month in advance, no refunds will be made. 4. We will not have After Care on Fridays as students are expected to leave with their parents after the Parent Showcase. 5. Week 1 will begin on Tuesday, May 31. After Care will be provided from Tuesday to Thursday. 6. Week 6 will begin on Tuesday, July 5. After Care will be provided from Tuesday to Thursday. 7. Car pool ends at 3:30PM. So, parents picking up during After Care must park and come to room 345 to get their camper. 1. The last day of each camp will end in a Parents' Showcase. 2. 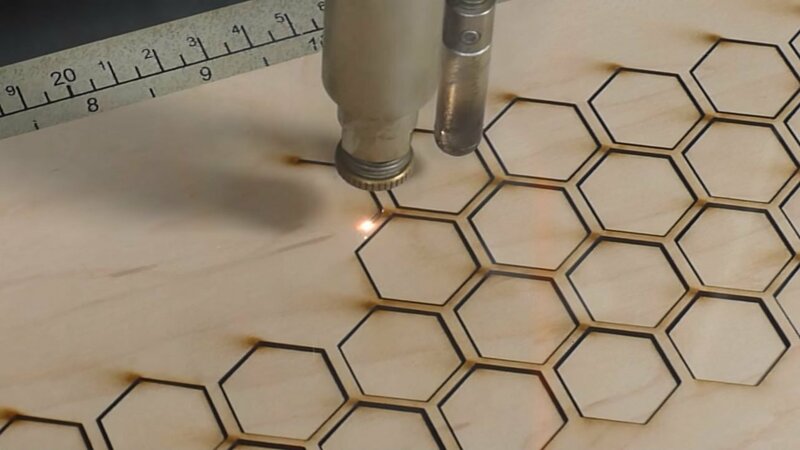 This is an opportunity for each camper to show off his or her creations. 3. This is also an invitation for parents to observe the creative learning environment that our camps offer. 4. If attending, parents should park in the designated lot or parking deck. 5. Students are expected to leave with their parents at the end of the Parent Showcase. The expectations below are included in the summer camp application. Both you and the student must acknowledge that you understand these expectations by digitally signing the contract. Georgia Tech computers should NOT be used to look up any materials deemed inappropriate in nature. Any violations will result in actions being taken to include (but not limited to) notification of the parent, the Dean’s Office, and/or Georgia Tech Police. Respect the property and feelings of fellow summer program students, teachers and student assistants as well as all others not directly associated with summer programs. Always act in a manner that will promote a classmate's opportunity to learn in a safe and supportive environment. Have a positive attitude about learning and involvement during the summer program. Politely communicate any concerns directly to summer program instructors or student facilitators. As we are doing a great deal of arts and crafts as well handling small building materials, campers will be expected to keep their work areas as clean as possible during the day. Camp instruction and activities will end at 2:50PM to include a cleaning of all workstations and the room in preparation for the following morning of camp. The hour before the Parent Showcase will be used in part to clean in preparation for the event. No "horseplay", inappropriate behavior or language of any kind will be tolerated. Students are representatives of Georgia Tech during their involvement with the summer programs, and they should act accordingly. No drugs or tobacco are permitted on the Georgia Tech campus by summer program participants. If your child requires prescribed medications, please include a note that indicates the name of the medication and when it should be administered. The medication must be in the correct prescription container. No weapons of any kind are permitted in our camps. This includes guns, knives, switchblades, pocketknives, and any other instruments that could be used as weapons. Any student who brings a weapon to a summer program or uses Georgia Tech computers inappropriately will be handed over to the campus police and immediately dismissed from the program. Violation of these expectations will result in the immediate dismissal from the camp without a refund of camp fees. Dismissed campers will not be allowed to return to OEC camps in the future. Campers will be moving around a classroom doing arts and crafts. Wear clothes that are comfortable and are OK for glue and spills. Some activities as well as the walk to lunch will be outside. Wear comfortable shoes and dress appropriately for the weather. Please send your camper with a swimsuit, towel and goggles if needed. They will need a pair of pool shoes or flip flops to wear to the pool as we will be leaving their camp shoes and any other valuable belongings locked in the classroom. Campers will change into and out of their swim clothes in the recreational center locker rooms. We are not responsible for any lost or damaged items. Expensive jewelry, clothes or shoes that may get messy or lost. Open toes shoes except when going to the pool on Wednesdays. On Wednesday, campers who will be participating in pool activities will need to bring a bag containing their swim clothes; towel; pool shoes or flip-flops. Campers may also include wearable floaties and goggles if desired. This bag will hold their regular clothes while they are swimming. Please label the bag and all of its contents with your camper's name. Each camper should bring a water bottle that can be refilled during the day at our water fountains. Although lunch is provided, campers may bring a lunch. Campers may bring cell phones only to be used outside of instruction and activity times or to be used in cases of emergencies. We are not responsible for lost or damaged phones. Snacks are not needed unless the camper has indicated dietary restrictions. Morning and Afternoon snacks will be provided. Money is not needed unless the camper wants to bring a few extra dollars to spend in excess of the money provided for lunch. Cancelations made prior to a month in advance of the camp and after care fees will be issued a full refund. Any cancelation occurring after the one-month deadline will result in the forfeiting of camp and after care fees. Please be advised that most parking on campus is by permit only. Parking in the designated visitors' lots (see below) and paying the parking rates is the best way to avoid possible tickets, booting and impound fees. We will not reimburse for the fines. Georgia Tech is serviced by two MARTA rail stations: Midtown and North Avenue Station. These stations can be accessed by the red and gold metro lines. We recommend that you take the rail to the Midtown Station and then take the Tech Trolley (at no cost) to the camp location. The Georgia Tech campus and its neighboring MARTA rail stations are served by several MARTA bus lines. 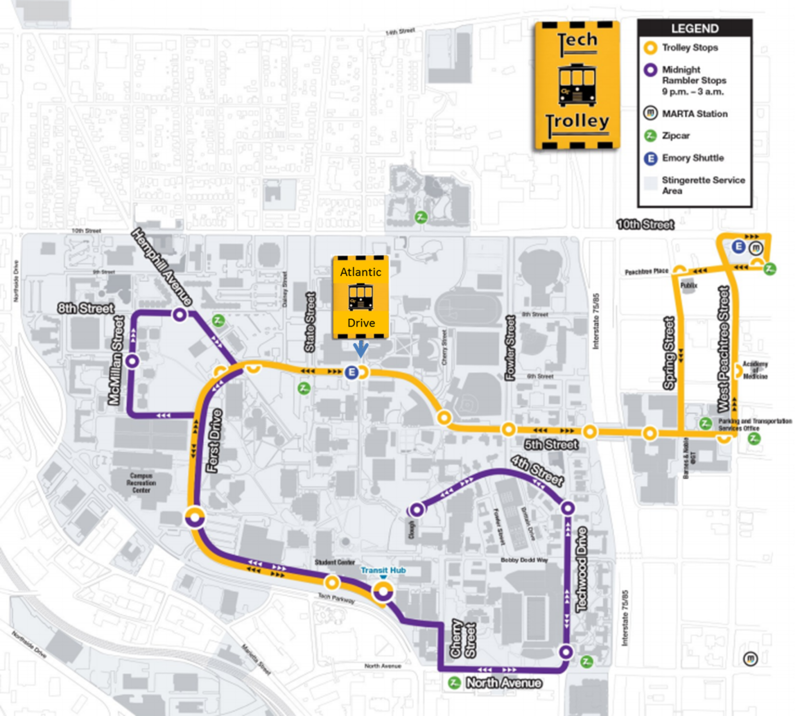 Below are links to route maps servicing the campus. Once you are on the Trolley, take it to the Atlantic Drive stop and follow the walking directions below. Take the stairway on your RIGHT to the top floor and follow the signs to room 345. Go through the light at Atlantic Drive and make the next LEFT at State Street. Make an immediate LEFT into the Visitors Lot. 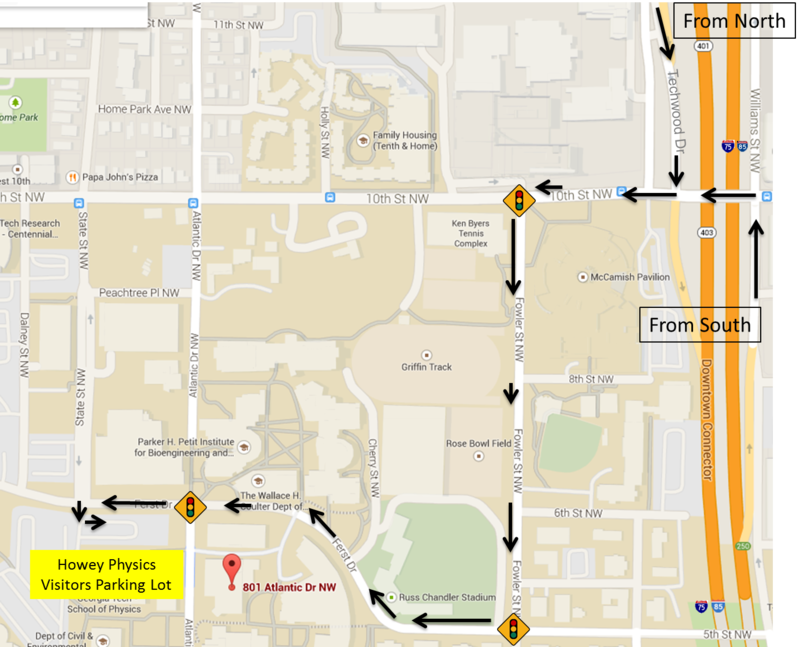 Please be advised that most parking on campus is by permit only. Parking in the designated visitors' lot and paying the $2/hr parking rate is the best way to avoid possible tickets, booting and impound fees. We will not reimburse for the fines.